"A douche is a device used to introduce a stream of water into the body for medical or hygienic reasons, or the stream of water itself." 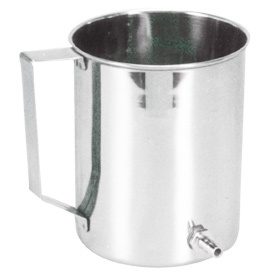 The 'can' holds the fluid (generally water) for douching. The problems of indigestion, gas and constipation are very common. A Douche Can Set acts as an internal cleansing device and relieves the patient of the said problems quickly and safely. GPC Medical Limited, internationally renowned manufacturers & exporters of hospital equipment & devices, offer clinically hygienic, made from medical grade material, Douche Can Sets in different capacities. A set comes with 1 accurately graduated s.s. can with cover, 1 tight fitting PVC tube (60"), 1 fixed nozzle and leak proof end plugs. The GPC Douche Can Sets are not only convenient internal cleansing device but they are economical and durable also. They can be washed and cleaned easily. They are regularly exported, in big quantities, to many different countries. Send Your Buy Requirement For "Douche Cans (Irrigators)" AND Get Quote Quickly.